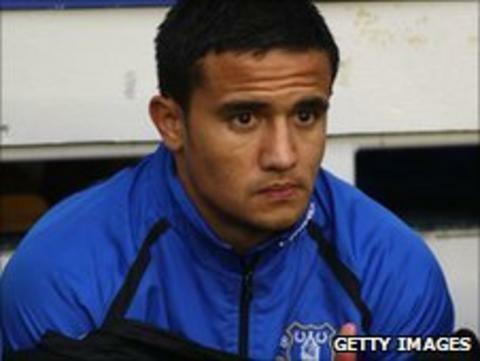 Everton midfielder Tim Cahill says he is not concerned by the club's lack of transfer activity this summer. The Blues have sold striker James Vaughan to Norwich and brought defender Eric Dier on loan from Sporting Lisbon. Cahill told BBC Radio Merseyside: "We've tied some pretty important players to Everton for a long time. "We're trying to build something special. If the funds are there, they're there, and if they're not, we'll have to deal with it." The Everton squad are touring the United States and have pre-season friendlies with the Philadelphia Union on Wednesday and DC United on Saturday. Despite many injury problems last season, Cahill's team managed to end the season in seventh position in the Premier League, collecting 32 points from 19 games since the start of January. And the Australia international is optimistic about the Blues' future because they are able to keep their big players happy at Goodison Park, while other clubs are losing their top stars. "I think for us as players, it's best that we focus on the good things," Cahill continued. "I'm focusing on us keeping our best players. I know a lot of the big clubs are struggling to keep their best players. "As for players coming in, I try and stay focused on the football, but sometimes you can understand the fans' frustration. "The main objective for us are the players that are a part of the squad now, and do as best we can to make the fans happy."